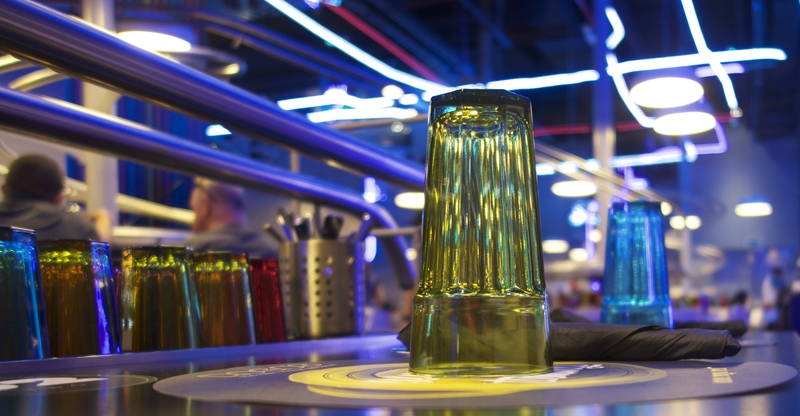 As a mother of three now grown-up children, I have served my time in novelty restaurants over the last twenty years back in their younger years on holidays, trips out and birthday parties. 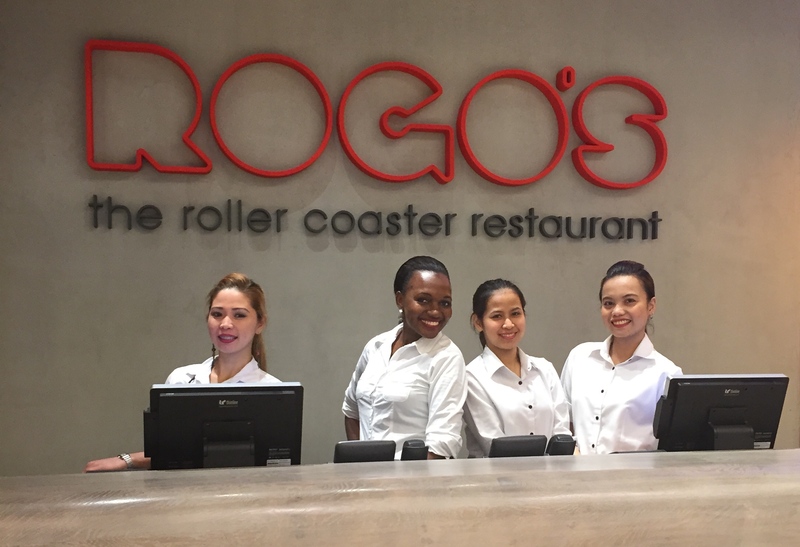 Many a trip to Disney restaurants in Florida, theme parks, Hard Rock cafes around the world, Planet Hollywood’s, Rainforest Cafes and even a NBA themed affair and I have on occasion found the novelty factor has taken over the quality of food but I’m pleased to report that at the newly opened Rogo’s Roller Coaster restaurant here in Abu Dhabi, that’s not the case. 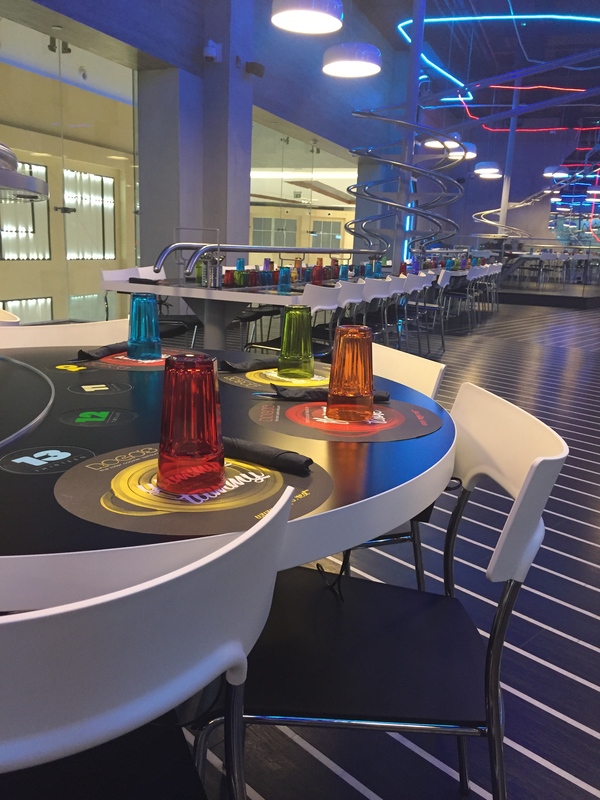 My family and I were very kindly invited to visit the surprisingly large double storey restaurant (a massive 14,000 square foot) which is located in Yas Mall, for dinner last week and we had a very enjoyable experience from start to finish. 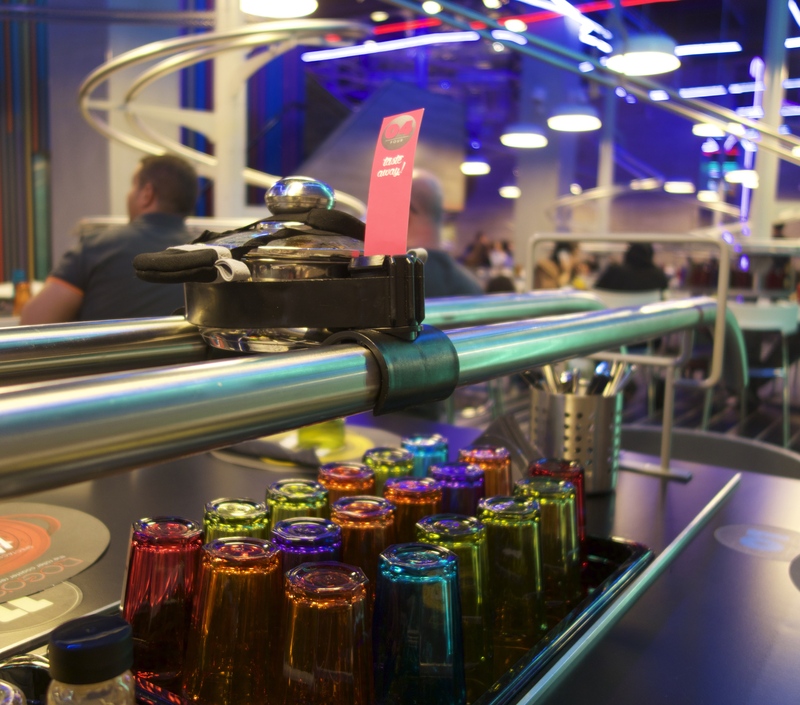 The concept is a little unorthodox as your food arrives whizzing down a spiral, through a tornado loop and along double metal tracks above your head, but that doesn’t limit a vast array of choices from the international menu from Loop-the-Loop Calamari, Burgers, Salads, Pastas, Home Comforts, Desserts to a separate Children’s menu (see full menu here). 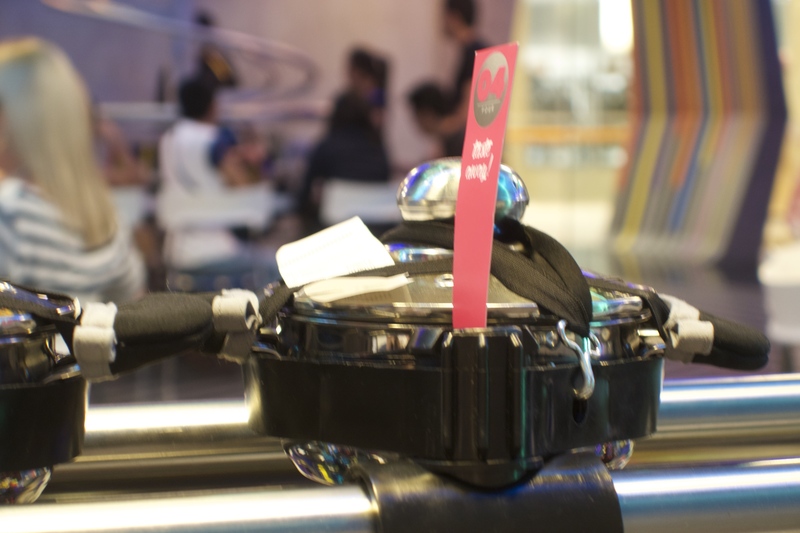 The state-of-the-art ordering system via individual handheld tablets located under the tables, enables diners to order individually (one limitation is you can’t customise your order) to your unique place and table number which then corresponds with the food as it arrives on the tracks in front of you in sealed pots. 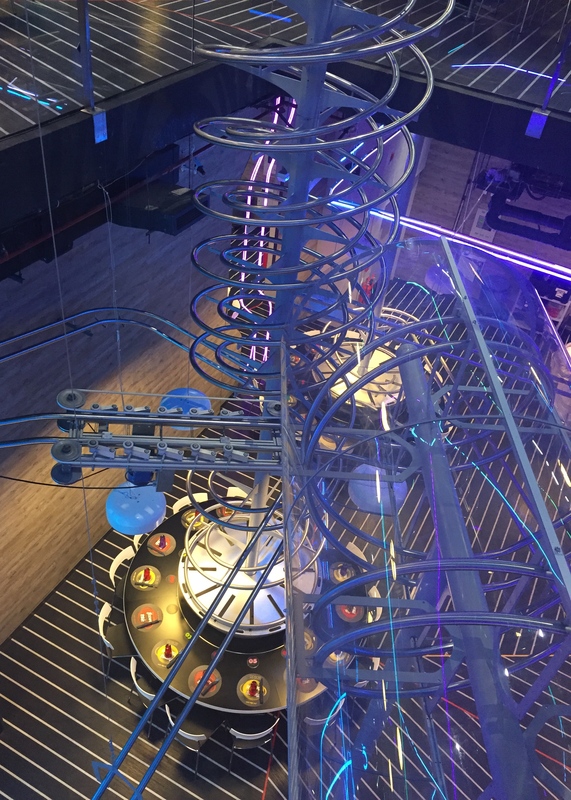 There are a couple of huge multi-spirals, double loops and tornado tracks that make up the network of thirty roller coasters that the food and even your cold drinks (hot drinks for obvious safety reasons are delivered in a conventional way by a server) travel down to arrive at their final destination (travelling up to 8km/h). 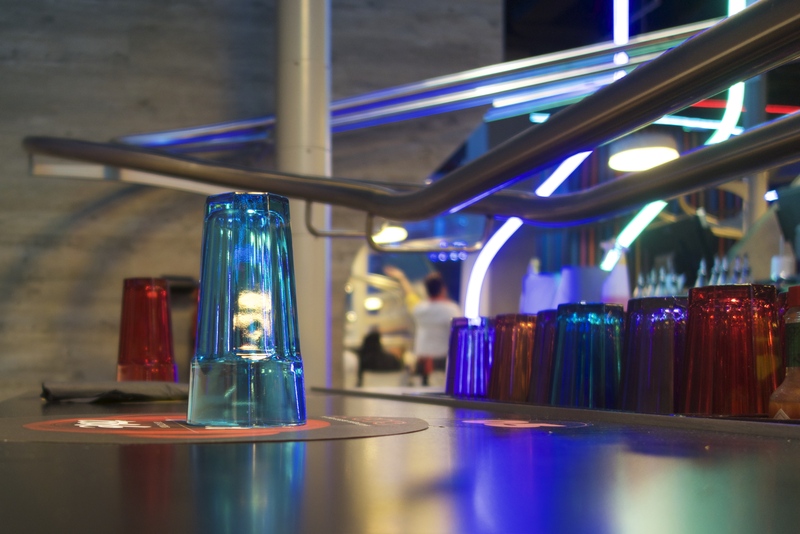 We started with drinks and we were all equally fascinated and excited by the ordering process (I’m sure the tablet led younger generation have no problem), once we had got the grip of it from our servers explanation. Items are selected and put in your shopping cart (much like an online shopping order), then ordered and our selected beverages arrived much quicker than I anticipated. 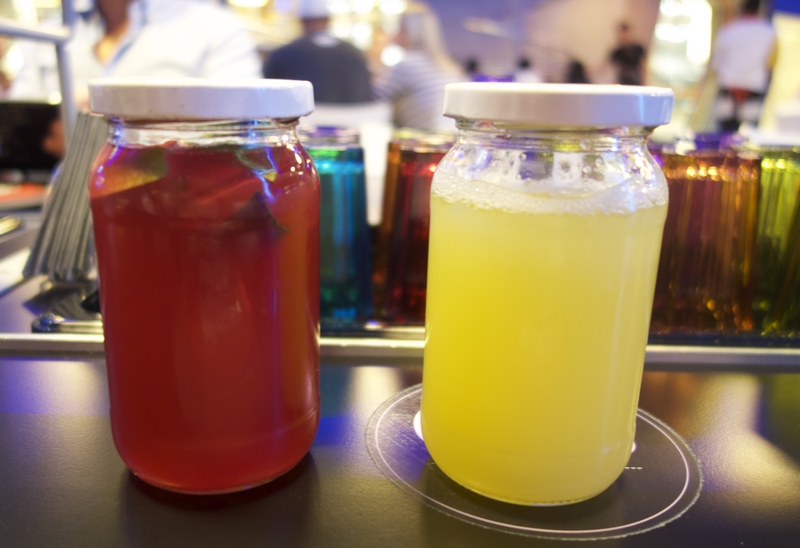 I was curious to how the zany concept worked with drinks travelling down gravity-defying rollercoaster rails but the range of Iced Teas, Fresh Juices and Milkshakes are cleverly delivered in jam-jar type vessels with secure lids which could then be transferred to the multi-coloured glasses already on the table. The beauty of the digital menu is it can be updated and new dishes added at the touch of a button ensuring the best options for diners. Next step was ordering the food, I took a methodical approach ordering my starter and then waited awhile before ordering my main course which proved the correct idea as both my other family members selected both courses together in their online baskets so they arrived together! Starters of Goats Cheese salad, Thai Crab Fish cakes and Chicken Lettuce wraps speedily arrived along the silent delivery system, all served with a fresh and generous portioned salad and were hungrily devoured. These were swiftly followed by main courses of Mozzarella and Roast Vegetable Focaccia, Grilled Chicken and Asparagus with a side of Slow Roasted Vegetables along with the teenagers predictable choice of Rogo’s Classic Burger and a mountain of fries all of which appeared in record time, as I frantically tried to catch their arrival on camera. Even though we were so full (carb overload), I was convinced by several servers to try a dessert and succumbed to some Nutella Profiteroles much to the teenagers disapproval. Nutella is her absolute favourite thing but as she’s given up chocolate for Lent, my dessert choice was a real test of her will power as she sat next to me scowling but resisting temptation nonetheless. 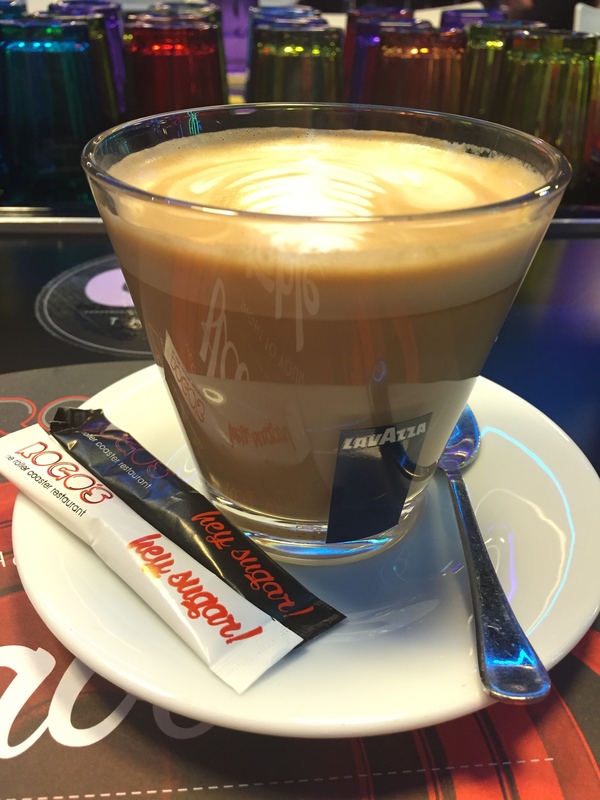 We finished off with a round of teas and coffees, served this time on a tray by the very helpful and friendly staff. 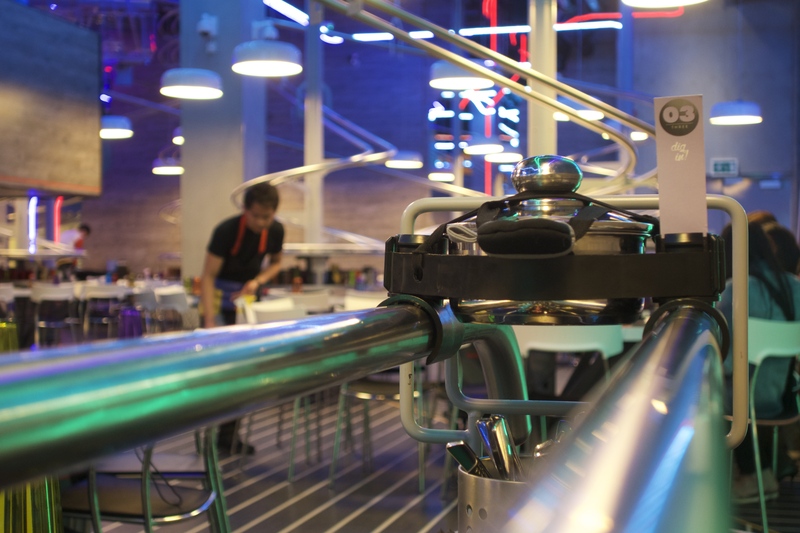 The food may be fast, which is reference to the speed of its delivery rather than the quality, but the experience is great fun and it’s very popular here as the huge 360 seat restaurant is full to capacity at the weekends, with waiting lists. 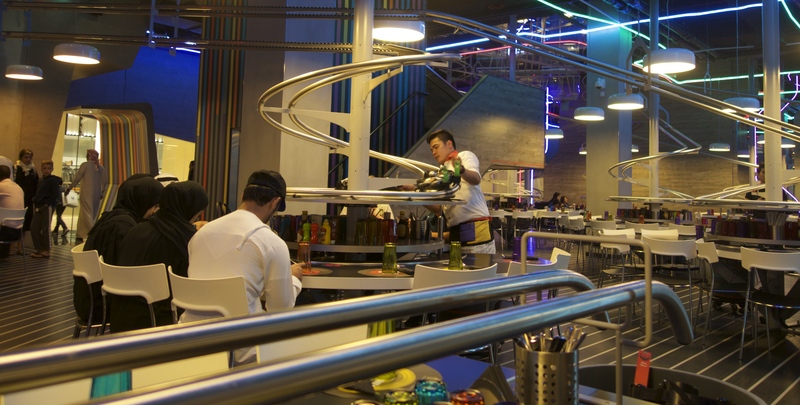 It seems very fitting that the world’s biggest roller coaster restaurant is located in a mall connected to Ferrari World which is home to Formula Rossa, the world’s fastest roller coaster. 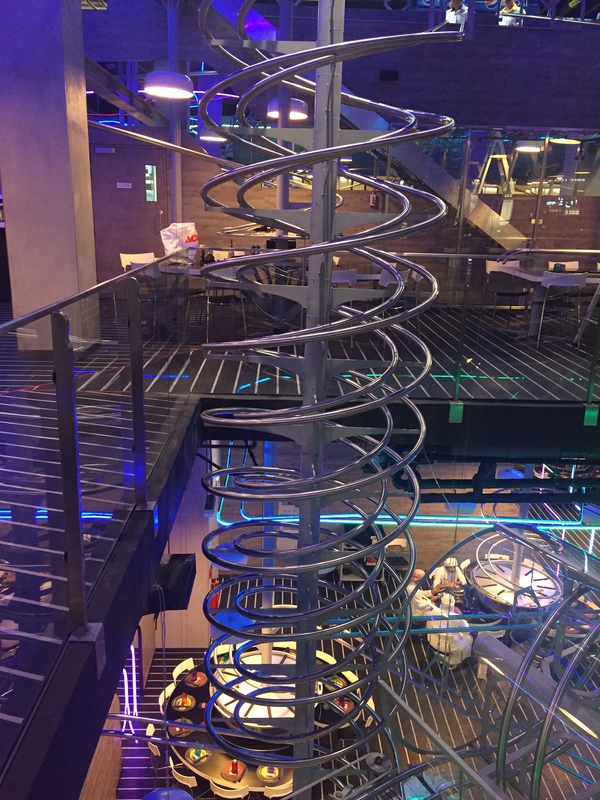 I can only imagine the sheer delight and excitement of younger children as they watch their food hurtle down a spiral and whizz along the tracks, but it’s also great for big kids too and the night we went the restaurant was full of adult diners. 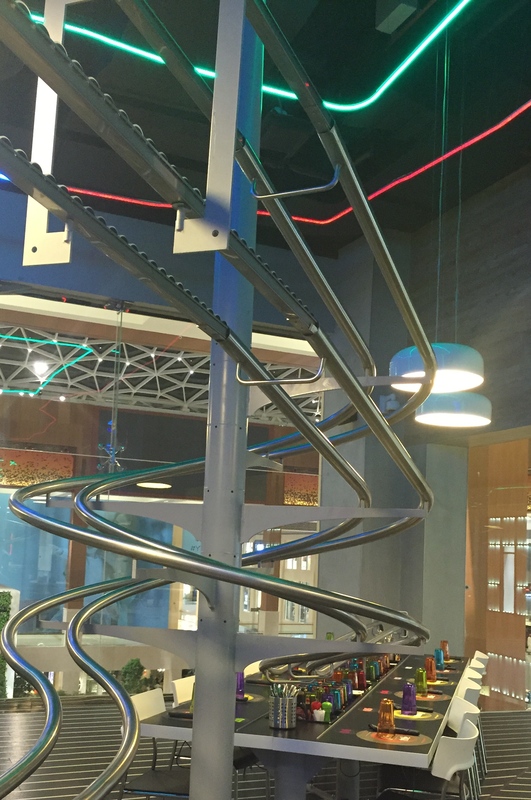 So if you fancy giving your dining experience a new twist, pop along to Rogo’s Roller Coaster restaurant on the upper floor of Yas Mall, for a one-of-a-kind visual dining adventure. I was invited to review this restaurant but all the views are my own. Unless otherwise stated all photos © Jo Brett 2015. All rights reserved.